Aside from the subject matter, several aspects of the window designs are atypical. Because the windows on the lower level are extremely narrow-between 16 and 20 inches wide-Lacy had to create a series of drawings that would �fool the eye.� Although individually designed, the panels should be read as a total horizontal image. 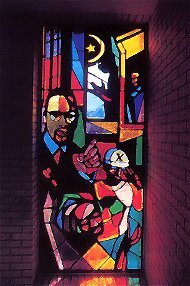 The dematerialization of form so prevalent in Lacy�s collages is difficult to achieve in stained-glass windows, which consist of defined areas of color. Only when light streams through the windows do the colored panels blend into a unified image. Like the Renaissance artists Michelangelo, Leonardo da Vinci and Raphael, who were commissioned by the church, St. Luke and Jean Lacy have created for generations to come an important monument that commemorates the spiritual journey of a people whose struggle is borne out in progress and inspired ultimately by a deep, abiding and unshakable faith.